Leyton Parish Church of St Mary lies on Church Road in Leyton. The earlier building was probably Norman, but rather than repair it when it was in a bad state in 1640, the decision was announced that it would be rebuilt. 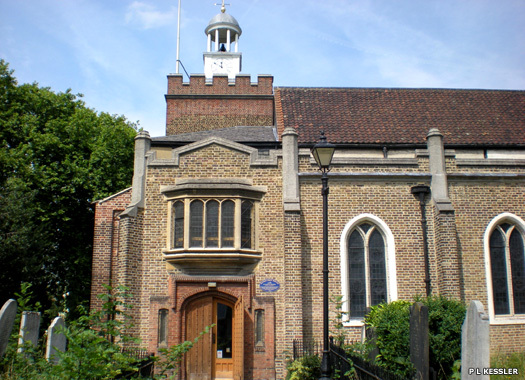 In 1658-1659 the tower had become so dilapidated that it may fall down any moment, so it was rebuilt in red brick, with a small lean-to vestry on the north side. A north aisle was added in brick, leading from the tower to the west (on the left here). Further improvements were made in 1711, and the church was enlarged in 1822, all helping towards the general mismatched impression the building has. The clock in the tower looks out of place because it came from Leyton Great House, the largest mansion in the area, which was built in 1700 and which was sadly demolished in 1905. 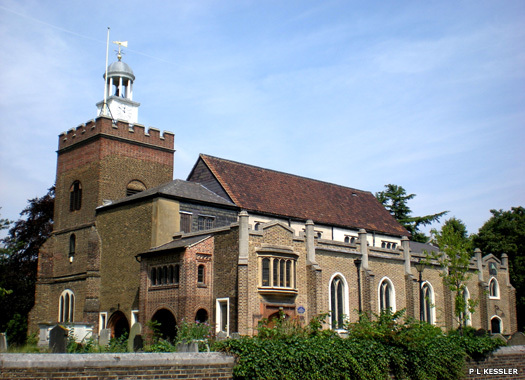 The parish is now united with those of St Edward's (now Christian Hope Ministries) and St Luke's (now St Eleftherios). Leyton Salvation Army corps opened in 1883 in Church Road, and then moved to a purpose-built hall in the High Road. In 1908 a new building opened on this site in Lindley Road, but this was replaced by another new building in 1931, known as 'Salvation Castle' thanks to its battlements. During the war the High Road citadel was badly damaged and in 1959 abandoned. Leyton corps closed in the early 2000s and amalgamated with Leytonstone. The building was passed on. 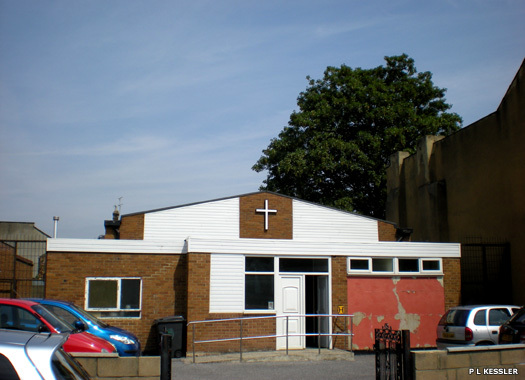 Grange Park United Reformed Church also pays host to the Lighthouse Chapel International, as well as proclaiming the union of Congregationalists, Presbyterians, and Churches of Christ on its sign, a merger which took place in 1972. 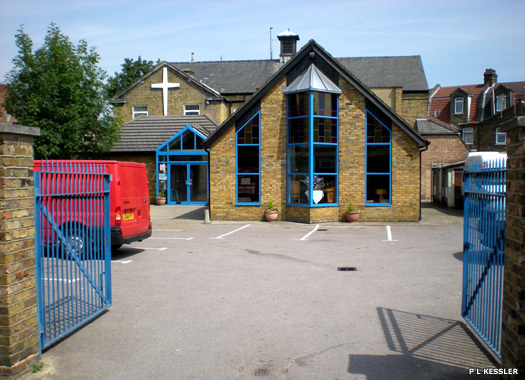 The church building is a modern addition to an older one, set back from the road in its own walled courtyard, and faces Grange Park Road, in the triangle between that, Church Road, which houses St Mary's, and High Road Leyton. 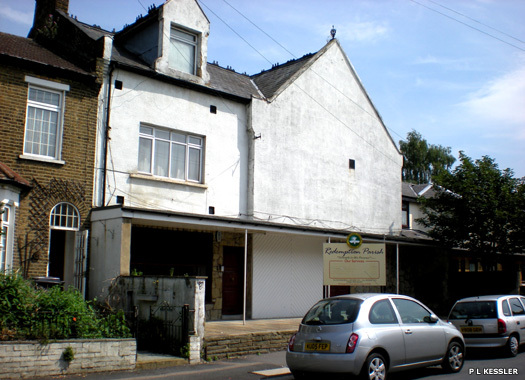 The Redeemed Christian Church of God, Redemption Parish is an African-born church movement from Lagos which is at the southern end of Grange Park Road, almost on the corner of Church Road and very close to St Mary's and Grange Park URC. Apparently it is affiliated with the branch of the same name which holds its meetings at the Legacy Business Centre on Ruckholt Road, next to Leyton Library. 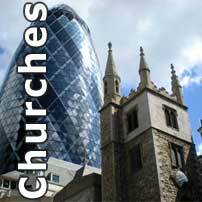 The church was born in 1999 when the Angel Parish restructured. 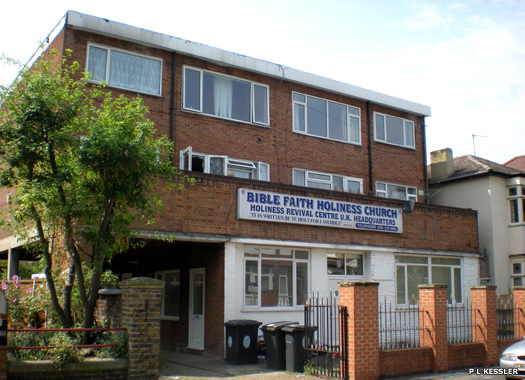 The Bible Faith Holiness Church lies immediately next to St Joseph's church hall and forms the 'Holiness Revival Centre UK Headquarters'. It is one of a series of minority African gospel church movements to be dotted across the capital, and it professes to preach through the establishment of Bible schools like this one which is in a small 1950s apartment block. This appears to be its only branch in the British Isles, with two more in the USA and one each in Ghana and Nigeria.